Arrive in Munich and transfer to a centrally located hotel, where you’ll enjoy a two night stay. This evening, meet your fellow travellers and Tour Director over a welcome drink to celebrate the start of a wonderful journey. Explore the Bavarian city of Munich with your expert local guide who’ll help you discover the wonder of this fine city, including the Marienplatz, Glockenspiel and Viktualienmarkt. Tonight enjoy a sumptuous dinner of traditional German cuisine. This morning, visit the majestic spires of Neuschwanstein Castle and discover some of its fascinating back-story before continuing to Salzburg for a stay at your luxurious hotel. Today, enjoy a walking tour that includes locations used during the filming of ‘The Sound of Music’, as well as Mozart’s birthplace and residence. Then, continue to Vienna where you will enjoy an overnight stay at your centrally located hotel. After breakfast, transfer to Vienna airport for your onward or homebound flight, taking many wonderful memories with you. From Vienna to Zurich, take in the beautiful Alpine Highlights. 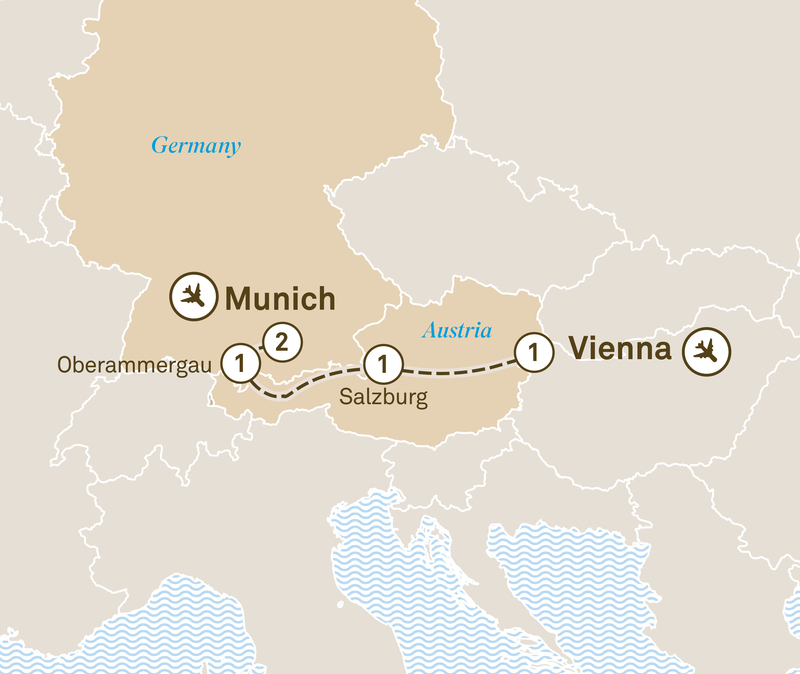 Visit the Imperial Palace in Vienna, attend a performance at Oberammergau & explore Munich. Start your 20 day combined land tour and cruise in the beautiful Bavarian city of Munich. Explore Salzburg and Vienna before your cruise from Budapest.